With the launch of Tahiti behind them, AMD is now firing on all cylinders to get the rest of their Southern Islands lineup out the door. Typically we’d see AMD launch their GPUs in descending order of performance, but this time AMD is taking a slight detour. Rather than following up the Tahiti based 7900 series with the Pitcairn based 7800 series, AMD is instead going straight to the bottom and launching the Cape Verde based 7700 series first. Today AMD will be launching two cards based on the Cape Verde GPU: the Radeon HD 7750, and the Radeon HD 7770 GHz Edition. As the Juniper based 5700 series never got a proper Northern Islands successor, this is the first real update for the x700 series since the launch of the 5700 series in October of 2009. 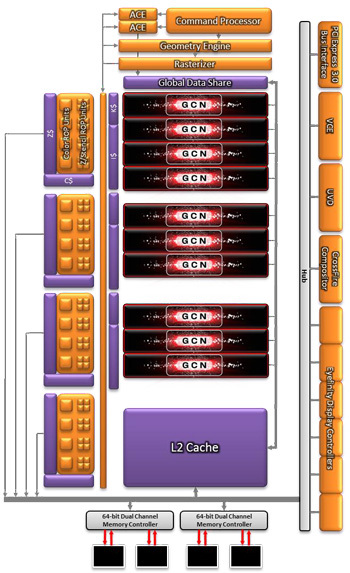 Given the success of the 5700 expectations are going to be high, and to fulfill those expectations AMD will be bringing to bear their new GCN architecture along with a full node jump with TSMC’s 28nm process. But will this be enough to enable the 7700 series to replicate the success of the 5700 series? Let’s find out. With the 6000 series AMD effectively had a 5 chip stack: Caicos (6400), Turks (6600), the rebadged Juniper (6700), Barts (6800), and Cayman (6900). Since then integrated GPUs have effectively wiped out the low end of the market, and by the time Trinity launches later this year any product short of 6600 performance should be made redundant. 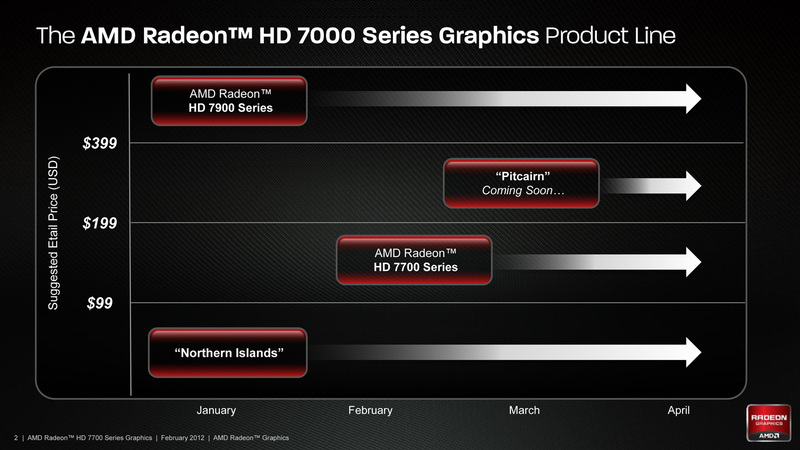 As a result AMD has reigned in on their spread out stacks, leading to their 28nm Southern Islands product stack being just 3 products: Cape Verde (7700), Pitcairn (7800), and Tahiti (7900). Anything below the 7700 series will be rebadged Northern Islands parts, primarily Turks and Caicos. But AMD’s product stack doesn’t tell the whole story. AMD will need to cover a wide range of products and price levels with only 3 GPUs, ranging from $109 to $550. As a result the performance levels of AMD’s various product series are being redefined somewhat, and nowhere is this more apparent right now than with the 7700 series. Why do we say that? Well let’s take a look at the specs and pricing. Cape Verde, the GPU at the heart of the 7700 series, is AMD’s smallest 28nm GPU. With a die size of 123mm2 it’s only a hair bigger than the 118mm2 Turks GPU that powers the 6600 series. In terms of functional units we’re looking at 10 Compute Units, giving Cape Verde 640 SPs and 40 texture units. Elsewhere Cape Verde packs 16 ROPs, 1 geometry engine/rasterizer pair, and 512KB of L2 cache, with the chip coupled to a 128bit GDDR5 memory bus. Altogether compared to Tahiti this is around 31% of the CUs, 33% of the memory bus width, and half as many ROPs. Interestingly, unlike Tahiti, Cape Verde’s CUs are organized slightly differently. GCN is designed around 4 CUs in each CU Array, with the 4 CUs sharing a read-only L1 instruction cache and a read-only L1 data cache. This is how both the 7970 and 7950 are organized, with the 7950 simply lopping off a whole CU array. However with Cape Verde 10 CUs doesn’t cleanly divide into groups of 4, so for the first time AMD has built something a bit different. In Cape Verde there are 3 CU arrays, populated in a 4/3/3 manner. With regards to performance there shouldn’t be a huge difference, but this does mean that there’s a bit less cache pressure on the CUs occupying the smaller CU arrays. On the functionality side of things, backing up Cape Verde will be the rest of the Southern Islands family features we’ve already seen on Tahiti, such as DX10+ SSAA, PowerTune, Fast HDMI support, partially resident textures, D3D 11.1 support, and the still-AWOL Video Codec Engine (VCE). Even FP64 support is accounted for, however similar to how NVIDIA handles it on lower-end parts it’s a performance-limited implementation for compatibility and software development purposes, with FP64 performance limited to 1/16th FP32 performance. 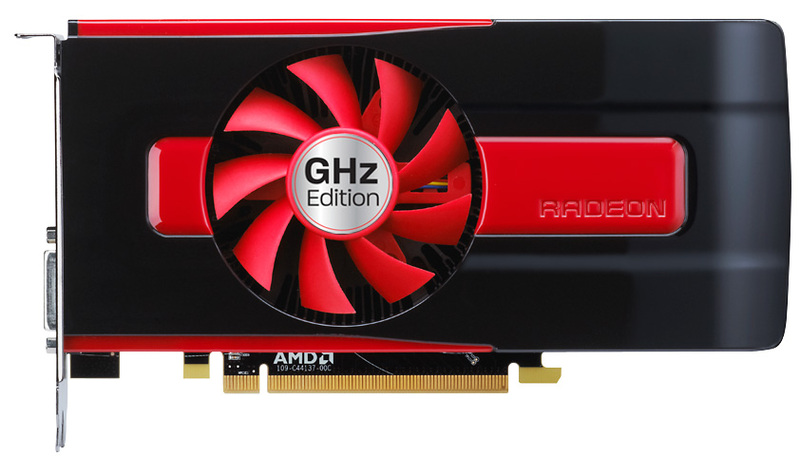 As for the cards themselves, AMD will be releasing two Cape Verde cards: the Radeon HD 7750, and the Radeon HD 7770 GHz Edition. The 7770 will be a fully enabled Cape Verde with all 10 CUs (640 SPs) enabled, running at 1GHz for the core clock and 4.5GHz for the memory clock, with a PowerTune limit of 100W and an AMD defined typical board power of 80W. The 7750 meanwhile has 2 disabled CUs, giving it 512 SPs and 32 texture units, while the ROP count is unchanged at 16. The core clock will be 800MHz while the memory clock is the same as the 7770 at 4.5GHz, with a PowerTune limit of 75W and a typical board power of 55W. Both cards have a sub-10W idle TDP, while long-idle is sub-3W. With those specs in mind, it’s interesting to note that the difference between the 7750 and 7770 is much wider than we’ve seen in past products. Compared to the 7750, the 7770 has 25% more CUs and a 25% core clock advantage, giving it a massive 56% shader and texture performance advantage over the 7750. With the 5700 series this gap was only 35%, and most of that was a result of core clock differences. The fact that the memory bandwidth is the same between the 7770 and 7750 equalizes things somewhat, but it’s still a huge difference for two cards that are in the same family. This brings us back to where we started: how AMD is covering the entire $109+ market with only 3 GPUs. Between the massive performance gap between the 7700 series cards and the fact that the 7750 is a sub-75W part, it becomes increasingly obvious that the 7700 series is the de-facto replacement for both the 6600 series and the 5700 series. The 7750 will fill the 6670’s old role as AMD’s top sub-75W card, but as we’ll see its performance means it won’t be a complete replacement for the 5700 series. Instead the role of replacing the 5700 series falls to the much more powerful 7770. As for today’s launch, AMD will be launching the 7750 at $109 and the 7770 at $159, which happens to be the same prices the 5770 and 5750 512MB launched at respectively. With midrange cards there usually aren’t any supply issues and we aren’t expecting the 7700 series launch to be any different, however as is customary AMD’s partners will be launching semi-custom cards from day one, so pricing will probably be inconsistent. At these prices the 7700 series will be competing with a number of last-generation cards. The 7750 will be up against AMD’s 5770/6770 and the absolute cheapest of NVIDIA’s GTX 550 Ti cards. Meanwhile the 7770 will be competing with AMD’s 6850 and 6870, along with NVIDIA’s GTX 460 and their cheapest GTX 560s. And as we’ll see in our benchmarks, this is ultimately going to be more than the 7700 series can handle. For AMD cards, you look at the second number to indicate performance. An 8 series card like in the 6850 usualy performs as well or slightly better than a next generation 7 series card like the 7770. The anomaly here is the NVIDIA Gtx460 SMOKES the 7770 on everything, in every test, and costs 33% less. I see the crazed fan base cannot bring themselves to say it. I'll say it - 19 pages unsaid, over a long time. Using your logic a gtx 580 smoke the gtx 460. The reason why 7770 costs a bit is because its new technology, power consumption goes down quite a bit. Compare the card to same power consumption of new generation card maybe a 7870 and the 7870 will smoke the gtx 460. LOL - How low can you go amd ?